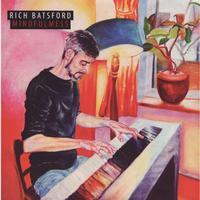 Rich Batsford is a very talented musician and writer, whose vocal harmonies are arranged as an art form, and - in some ways – it is possible to listen to this album as one big song with various compositional themes and arrangements. It includes artistic flair and mild Buddhist philosophy from a musician who truly immerses himself into his chosen field. Batsford plays Roland’s FP4 digital piano which seems to give him the scope to try numerous musical and vocal styles and, yet retain strength in the foundation of his writing. The CD packaging is a slim-sleeve design with a distinctive painting by artist Helen Laishley on the front and some classy black and white photography in the booklet, complementing the lyrical layout. Overall, the album has a unique approach to the many elements of which it is made. Sounding somewhat like the works of Ben Folds, Rich captures a mood and develops the lyrical and melodic structure so that it cycles back on itself. The backing harmonies work as an instrument in their own right and the production atmosphere is saturated with spatial reverb. As an introduction to the CD, this short track – clocking in at just over 2:30 – summarises much of the direction and concept that is to follow. The running, playful piano lines are reminiscent of Joe Jackson and there is a story-like quality that enriches the music. With (what seems to be) a tip of the hat to the Beatles in the line “A child of the 60s me, living in a world of Let It Be” blended with Buddhist philosophy, there is a mixture of varied elements which are crafted together to form a sense of beauty. Back to an echo of Ben Folds, the motivation of forward moving piano creates momentum until brief pauses draw back the progression to a slightly staggered halt. There is a brief dissonant passage that is resolved, then the orchestration of voices resumes. The vocal arrangements tend towards Enya’s approach but are here composed alongside the straighter, single instrumentation of the piano’s major key sound. Here is a Beach Boys composition given the Batsford piano-voice treatment. It jumps about and is reminiscent of songs from the 1970s Broadway stage shows with the dramatic tempo changes and voices sung in rounds. There is obviousness in the climaxes and dynamic changes in playing that would suit stage work; a kind of “you know where this is heading” familiarity juxtaposed with a deliberate “but I’m not going to take you there... yet” cheekiness! In segued form, “Guessing Again” is tribute to Brian Wilson with numerous references to his work and life. The different aspects of the arrangement are interesting: the changing of styles and tempos of the various verses and choruses may actually remind the listener of acts as varied as Supertramp and Elton John. There is even an elongated musical break where Batsford manages to weave divergent vocal harmonies into the chordal solo passages of the keyboard, elevating the tapestry to a finely crafted piece of art. This soft yet moderately upbeat number extends the various qualities into a new, yet nostalgic, piece. Fitting in with the conceptual nature of the album, this reprises much of the previous tracks’ compositional draw cards with the beautifully produced Roland digital piano that is the foundation for this CD. The furthest backing vocals leap and soar like a bobbing bunch of mini Rich Batsford heads on the waves of consciousness, each popping up in turn with underscored accentuations and floating angelic tones. “On Til Dawn” is the most different of the tracks, so far, with a moody Rick Wakeman-esque introduction that carries along the arpeggiated modal lines throughout the track. Barring the 4-line repetitive lyric, this piece could virtually be listened to as an instrumental song. There is a central break that alters the 4/4 time signature, breaking into a triplet 12/8 pattern before returning and – if the listener can concentrate hard enough – there are harmonic overtones around the 3:40 mark where low natural flute sounds can be imagined. Reprising the main theme, each time differences can be felt and the music takes on new meaning in the grand design of this 6 and a half minute masterpiece. Solemn and funeral-like, the darker, moodier presence is felt with respect to Batsford’s empathic depth. The pauses accenting the lyrical breaks keep one on edge as he reaches for new, more difficult vocal highs – this time without any backing arrangement. In contrast, given that this CD works as one largely conceptual song, it is of no surprise that Batsford suddenly turns the track around in the later stages and returns to the format that has worked so well on the early portions of the album: upbeat, harmony-filled and pleasantly familiar. With Billy Joel in mind, the walking fingers are off on another journey and the thick, textured backing stands out again. There is a certain irony in Batsford’s music, an offbeat humour with beautiful, rich harmonies signalling a fanfare behind such lines as “Jesus was a rebel baby and so are you.” He never steps over the line into aggressive pronunciation, as could be the case with the shock tactics we might be used to with the traditional rules of musical word painting (where the word high might be sung in a higher register or ascending melodic glissando, for example). This is a nice, upbeat little number. Back to stage show territory, the introduction to “Jobbery” takes a departing route and balances itself with a lower register, bass-heavy piano style on this song. The reverb is bigger and the piano sounds more like a grand than has been previously explored on Mindfulmess. It would be interesting to know the differences with the recording style of this number from the previous nine tracks. Yet, as with most other cuts, the major key positivity is retained. To close the album, Batsford continues his musical exploration with self questioning lyrics and small key change inferences. The compositional changes in mood and dynamics are refreshing and Batsford’s orchestrated back-up vocals make a triumphant return. Again, the deep philosophical approach to his position in life is readily discussed with his devotion to Buddhism and reference to Taoist natural balance. He manages to close with a Beach Boys pop influence, ending abruptly the journey he began with such deep thought and light heartedness.